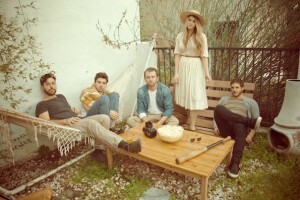 Milo Greene just make it so darned easy to like them. A winsome looking bunch, aren’t they? In chronological years the five piece ensemble made up of Robbie Arnett, Marlana Sheetz, Andrew Heringer, Graham Fink and Curtis Marrero has entered its ‘terrible twos’, yet it seems they’re behaving themselves quite nicely. The truth is that ever since gently debuting upon the local LA music scene in 2010, Milo Greene has delivered a whole new lush and crisp deliciousness to the folk rock arena that’s impossible to not fall for. And music fans all over the country have fallen for them like clockwork. Four harmonious voices seamlessly trading off and blending, musicianship that complements and a live show that- oddly- rocks well. Yes, they are one of my favorite local products and, yes, they are the headliners this Saturday, November 17th at the historic El Rey Theatre in Los Angeles winding down what’s been a solid touring year which included road time with the Civil Wars.